Not long after watching his team give up a program record 70 points against Memphis a couple weeks ago, UConn coach Randy Edsall stood up at the press conference following the game and when he was questioned about the effectiveness of the newly-installing 3-3-5 defense, he declared that it was not the scheme but the personnel that is the issue. "I have to answer this the right way because if I don't I know I will get crucified," Edsall said. "We decided to come in here and install a defense that we think is going to be good for us as we put this program together. The defense that we inherited is not built for this defense. If you look, we don't really have enough linemen to even play a four man front. If people want to question, it is not the scheme it is we have to get players in that can play the scheme that we want to play because of the teams we are going to have to play year in and year out and. Right now it is difficult. We don't have the personnel to play this, we do not have the personnel to play a 4-3. This is a big job we have undertaken to make better, fair and simple, and it isn't going to happen overnight, it just isn't." Since that time, UConn has received three commitments and two of them are linemen (I'll let the coaching staff determine if they play on offense or defense). Noel Ofori-Nyada, a lineman out of Arlington, Texas, committed not long after UConn won 28-24 at Temple. The 6-foot-4, 285-pounder out of Mansfield Timberview in Arlington, had some company as the most recent commitment is Dylan Niedrowski announnced his commitment on Twitter today. Niedrowski is a 6-foot-5, 280-pound lineman at Exeter Township in Reading, Pa. who has helped his team average more than 300 rushing yards and 7.4 yards per carry in the first eight games of the season. 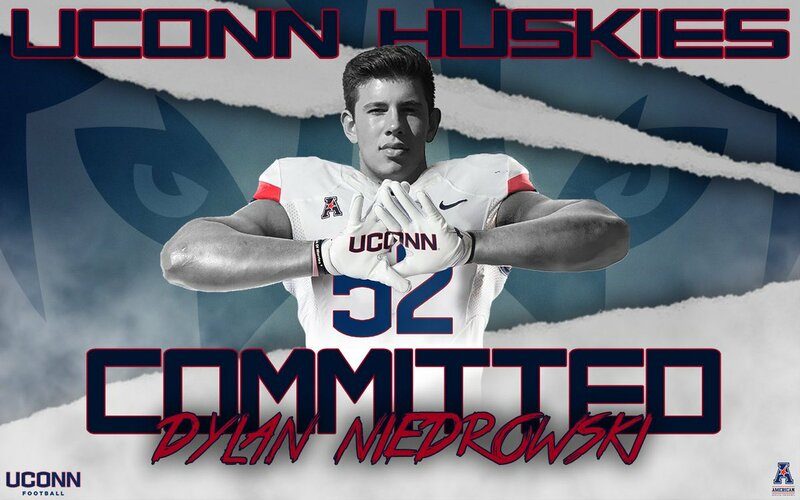 Since Wilbur Cross lineman Travis Jones committed in late July, Niedrowski is the fifth lineman to commit to UConn. Peter Rooney out of Atlanta committed two days after Jones, Liam Maloney (Schenectady, N.Y.) became a UConn pledge in early August. In late August it was defensive end Jonathan Pace out of Needham, Mass. followed in the last week by Ofori-Nyada and Niedrowski. Maloney had a sack and the ensuing fumble was recovered in the end zone as Holy Trinity rolled to a 42-0 win over Voorheesville to advance to the New York Class C semifinals against Chatham although at 6-foot-8, it sure seems like he'd be better suited to play offensive tackle at the next level. With UConn losing all three of its defensive line starters (Luke Carrezola, Foley Fatukasi and Cole Ormsby graduating) and Edsall admitting that getting more defensive linemen in place to play the 3-3-5 scheme, it's certainly a position that needs to be addressed. It's a position hit hard by injuries this season as 290-pound sophomore Philippe Okounam, 266-pound junior James Atkins and 255-pound sophomore Connor Freeborn are currently sidelined. The only true freshman defensive lineman who is being redshirted is 289-pound Caleb Thomas while Noel Brouse is a redshirt freshman who came into UConn as a touted prospect. The only UConn commit I have seen play live is Jones and I wouldn't be surprised to see him land on the defensive side of the ball. I won't be surprised to see more linemen join the list of UConn commits as Edsall looks to bring in the type of players suited for the defense being run by coordinator Billy Crocker. Speaking of linemen, here's a link to a piece on former UConn starting offensive tackle Andreas Knappe who was recently signed to the practice squad by the Washington Redskins. Also, former UConn safety Obi Melifonwu has returned to practice with the Oakland Raiders so perhaps he will be activated off injured reserve and make his NFL regular-season debut soon. Back on the subject of UConn commits, unfortunately this batch of pledges don't have as many coaches who utilize MaxPreps as past recruiting classes so it is harder to provide updates on them but here's a little bit of info. Recent quarterback pledge Steve Krajewski ran for a season high 44 yards and passed for 227 yards (completing 19 of 24 passes) in Colquitt County's 38-35 loss to Tift County. In nine games, he is completing 65 percent of his passes for 1,327 yards with 10 TD passes and one interception while adding 173 rushing yards. Jones had four tackles in Wilbur Cross' loss to Cheshire giving him 40 tackles, 5 tackles for loss and 3.5 sacks in six games this season. The Capital Prep duo of Khyon Gillespie and Oneil Robinson are putting up impressive numbers. Gillespie has rushed for 793 yards on 58 carries with seven TD runs to go with 166 yards on eight receptions not including last week's loss to Toronto Prep while Robinson is averaging 28.7 yards on 18 receptions. Robinson also has two interceptions. Heron Maurisseau had six catches for 93 yards (one shy of his season high in both categories) as St. Anthony's improved to 6-1 with a 29-3 win over Chaminade. Last but certainly not least, Hunter Webb has six straight games with at least 10 tackles. He has 118 tackles, 15 tackles for loss and six sacks in eight games at Loyalsock Township High School including a game with seven TFLs, four sacks and 149 yards on four rushing attempts.